We will subsequently look at the Method of Lagrange multipliers to find extreme values of a function subject to constraint equations. We will begin by laying down the foundation for this sort of problem. Theorem 1: Let $z = f(x, y)$ be a function subject to the constraint function $g(x, y) = 0$. 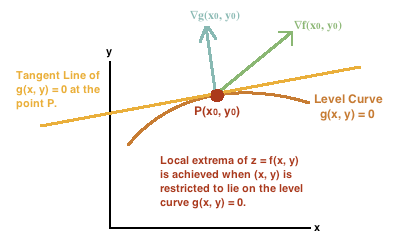 Let $f$ have an extreme value at the point $P(x_0, y_0)$ constrained for $(x, y)$ on the level curve $g(x, y) = 0$ and assume that that the point $P$ is not an endpoint of the level curve $g(x, y) = 0$ and that $\nabla g(x_0, y_0) \neq (0, 0)$. Then there exists a number $\lambda_0$ for which $(x_0, y_0, \lambda_0)$ is a critical point to the function $L(x, y, \lambda) = f(x, y) + \lambda g(x, y)$. Proof: Note that since $P$ is not an endpoint of the level curve $g(x, y) = 0$ and $\nabla g(x_0, y_0) \neq (0, 0)$, then we can assume that the level curve $g(x, y) = 0$ is a sufficiently smooth curve, and so a tangent line exists at the point $P$. Now recall from The Perpendicularity of The Gradient at a Point on a Level Curve that the gradient $\nabla g(x_0, y_0)$ will be perpendicular to the level curve that passes through the point $(x_0, y_0)$, i.e, $\nabla g(x_0, y_0)$ is perpendicular to to the curve $g(x, y) = 0$ at the point $P$. Thus, $\nabla g(x_0, y_0)$ is perpendicular to the tangent line at $P$. Now suppose that the gradient of $f$ at $(x_0, y_0)$, $\nabla f(x_0, y_0)$, is not parallel to $\nabla g(x_0, y_0)$ as depicted in the following illustration. Then the projection of $\nabla f(x_0, y_0)$ onto this tangent line is a nonzero vector, call it $v$. 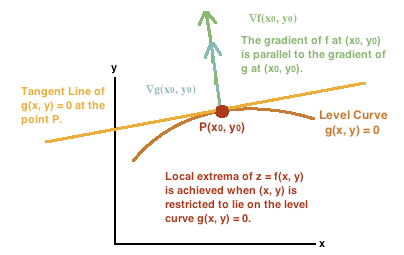 Thus, we have that $f$ has a positive directional derivative in the direction of $v$, and $f$ has a negative directional derivative in the opposite direction of $v$ which implies that $f(x, y)$ increases/decreases as we move away from $P$ and along the level curve $g(x, y) = 0$, and so an extreme value does not exist at $P$, which is a contradiction from assuming that $\nabla f(x_0, y_0)$ is not parallel to $\nabla g(x_0, y_0)$. So suppose that $\nabla f(x_0, y_0)$ is parallel to $\nabla g(x_0, y_0)$. Definition: If $f(x, y)$ is a function that has extreme values restricted by the constraint function $g(x, y) = 0$, then the corresponding Lagrangian Function is $L(x, y, \lambda) = f(x, y) + \lambda g(x, y)$. Note that we need not necessarily have to solve for $\lambda$. It is also important to note that $\nabla g(x_0, y_0) \neq (0, 0)$, that is, at a point of interest $(x_0, y_0)$ that produces an extrema in $f$, we cannot have that the gradient of $g$ at $(x_0, y_0)$ equals the zero vector. This is because in the argument above, we relied on the fact that $\nabla f (x_0, y_0)$ was parallel to $\nabla g(x_0, y_0)$. If $\nabla g(x_0, y_0) = (0, 0)$ then every vector is parallel to $\nabla g$! Note that since $\nabla f(x_0, y_0) = (0, 0)$ then this implies that $\lambda = 0$.